Gadolinium on the Brain: Curiosity or Cause for Concern? Gadolinium enhances the quality of MRI by altering the magnetic properties of water molecules that are nearby in the body. Gadolinium can improve the visibility of specific organs, blood vessels, or tissues and is used to detect and characterize disruptions in normal physiology. By itself, gadolinium is toxic. When used in contrast agents, the rare earth metal is bonded with a chelating agent. Bound to chelates, which vary across different gadolinium-based contrast agents (GBCAs), gadolinium is eliminated from the body. Every year, nearly 20 million patients in the United States undergo gadolinium-enhanced MRI studies to help their physicians diagnose and treat a wide variety of medical conditions, according to RSNA. "Gadolinium-enhanced MRIs often provide crucial, sometimes life-saving, medical information," says Max Wintermark, MD, a professor of radiology and chief of neuroradiology at Stanford University in California. The belief has been that gadolinium used in contrast is safe, leaving the body rapidly and completely in patients with normal kidney function. Yet when researchers from Japan noted progressive signal changes in specific areas of the human brain following multiple IV doses of gadolinium contrast, they speculated that these changes could be attributed to retained gadolinium within the brains of these patients. When the radiologists from Teikyo University School of Medicine in Tokyo and the Hyogo Cancer Center in Akashi reported their findings in Radiology online in December 2013, it raised some concerns. Additional follow-up studies from Mayo Clinic in Rochester, Minnesota, and the Japanese researchers confirmed the existence of long-term gadolinium deposits in brain tissues of human cadavers. The day after radiologists at Mayo Clinic "read the original 2013 manuscript from our colleagues in Japan, [we] found a few patients who had had multiple MRIs with contrast, retrospectively noted the same imaging phenomenon in patients who underwent multiple contrast-enhanced MRIs, and then decided to study this phenomenon further and find more definitive proof," says Robert J. McDonald, MD, PhD, a Mayo Clinic radiologist. The Mayo researchers published their findings in Radiology in June 2015; McDonald is the lead author of the study. The question is no longer whether gadolinium remains in the brain, but what it means. McDonald says no one knows the implications of this observation. "The community is still struggling to ascribe clinical significance to this finding," he says. McDonald believes that if there is an effect, it must be mild, given that "upward of 400 million doses of gadolinium agents have been given since we started using them almost 30 years ago, and if there was something toxic, we would have seen it by now." Wintermark agrees: "While gadolinium stains on the brain long after administration have been observed in several studies, we don't know what it means clinically. It has not been associated with any kind of clinical manifestations, but we want to take it very seriously." In July 2015, the FDA issued a communications bulletin that read: "It is unknown whether these gadolinium deposits are harmful or can lead to adverse health effects." This isn't the first time a safety concern over the use of GBCAs has arisen. In 2006, a Danish study reported that GBCAs could cause nephrogenic systemic fibrosis (NSF) in patients with acute or chronic kidney disease. NSF, first described in medical literature in 2000, is a rare but serious syndrome that involves fibrosis of skin and connective tissue throughout the body. As a result of the report on the NSF-gadolinium connection, most institutions now have a policy stating that GBCAs are to be avoided in patients with poor kidney function, says Rahul V. Pawar, MD, an attending neuroradiologist at Saint Barnabas Medical Center in West Orange, New Jersey, and a member of Radiology Today's editorial advisory board. There were not many documented NSF cases when this concern arose, Wintermark adds. 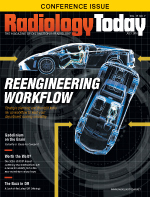 "But the radiology community took it seriously and does not administer gadolinium-agents to patients with kidney dysfunction." Because GBCAs are not used in people with kidney dysfunction, no new cases of NSF have been reported in the last four or five years, Wintermark says. "We have eliminated this risk by withholding contrast from patients with renal dysfunction," McDonald agrees. Unlike NSF, gadolinium deposition in the brain does not seem to be limited to patients with poor kidney function, Pawar notes. The patients who had gadolinium deposits on their postmortem brains did not have renal dysfunction. "Neuronal tissue deposition appears to take place in all patients exposed to gadolinium and is detectable with as few as four lifetime doses of GBCA," Pawar says. It is possible that even one contrast-enhanced MRI can leave gadolinium on the brain, but the amount may be so small it isn't detected by any instrumentation, the radiologists agree. Although it's not known whether the brain staining is a curiosity or a concern, the radiologic community is taking a similarly cautious approach to this latest safety question. In its communications bulletin, the FDA recommends that health care professionals consider limiting GBCA use to clinical circumstances in which the additional information provided by the contrast is necessary. Whenever physicians order imaging studies, they look at the benefits vs the risks, whether the risks are radiation from a CT scan or leftover gadolinium from an enhanced MRI, Wintermark says. "Each time we prescribe gadolinium, we ask if there is a very clear benefit for the patient in terms of their care. If we feel there is not a key benefit, then we just don't administer gadolinium. We try to reserve it for those patients where we feel it really makes a difference for them," Wintermark says. When ordering physicians order a contrast MRI, "if we have any doubt or anything is unclear, we will ask them what question they are trying to answer with this study and how it will impact the management of the patient before making a decision about administering contrast or not," he adds. In some instances, he says, MRI without contrast can be completely sufficient. In response to the recent findings and FDA communication on GBCAs and brain staining, the radiology department at the University of California, San Francisco, reviewed its MRI protocols for every body part by indication, says Christopher Hess, MD, PhD, an associate professor and chief of neuroradiology. "We went back and reviewed our protocols more carefully and made small tweaks in response, based on the anticipated added yield of gadolinium contrast," he says. Gadolinium has made it possible to better visualize abnormalities in fields ranging from oncology to blood vessel disease, he says. "It's really revolutionized the way we care for patients." Still, Hess says, as with any medication, "we must continue to make sure the benefits greatly outweigh the risks when we use this agent." Gadolinium agents can be either linear or macrocyclic. Linear chelates are flexible, open chains and don't have as tight a grip on the gadolinium. Macrocyclic chelates are preorganized, rigid rings and offer stronger binding. It is gadolinium that has been released from its chelate that appears to be deposited, Hess says. Radiologists are debating whether some contrast agents are safer than others. Linear agents appear to be associated with higher deposition rates, McDonald says. Peter A. Rinck, PhD, chairman of the European Magnetic Resonance Forum and president of the Council of the Round Table Foundation, also says that there is strong evidence that the deposit of gadolinium can be traced back to the linear agents. However, McDonald says, "It's an evolving subfield of this clinical issue and, like the use of gadolinium based-agents itself, we don't know yet, if one is safer than other. So it's stay tuned. It's not that simple." At Stanford, Wintermark says, "we consider all contrast agents similarly. We consider all of them the same when it comes to safety and don't use any unless there is a clear benefit to the patient." When selecting a GBCA, radiologists consider a number of factors, including not only its propensity to deposit in more sensitive organs, such as the brain, but also its diagnostic efficacy, target organ, rate of adverse reactions, and dosing/concentration, Wintermark says. "Although deposition is most clearly demonstrated with linear agents, it is reasonable to expect that it occurs with all agents to some degree," Hess adds. One group of patients who radiologists should pay particular attention to is those with chronic conditions who need to be assessed often during their lifetimes, Wintermark says. Multiple sclerosis (MS) is a good example: People with MS may undergo multiple MRI scans to determine the status of their disease and how well their medications are working. "The routine use of gadolinium for surveillance of disease in patients with a known diagnosis of MS is called into question" Hess adds. Pediatric patients are another group that requires special attention when it comes to this issue, Wintermark says. "We are going to think very carefully before we give gadolinium to children, just by virtue of their age and because of the lifespan they have in front of them," he says. Radiologists are eager for data that can confirm whether gadolinium retention should be a concern in any individual or group of patients. "Retrospective clinical studies are unlikely to be helpful in this regard," Pawar says. "But animal experiments are of potentially high value." One issue in researching the effects of gadolinium remaining in the brain is that no one knows what clinical outcomes to look for, the radiologists agree. Would it be movement disorders or cognitive issues? It's hard to know. Moreover, although the focus of attention has been on deposition of gadolinium in the brain, gadolinium deposits have also been detected in bone, Hess says. The radiologists agree that while they have no evidence of any harmful effects—at present—it is necessary to continue to pursue the observation until there is an answer and enough evidence either way. "Fortunately, we have not found a clinical symptom or condition associated with neural tissue deposition of gadolinium, and we all hope this continues to be the case with additional research," McDonald says. "We all want to do what's best for patient care, but we have to do our due diligence and study this phenomenon, too." Adds Pawar: "It is important to keep in mind that gadolinium chelates are critical to disease diagnosis by MR, indeed to clinical medicine worldwide, and have proven to be overall a very safe class of contrast media." It is good that the radiology community is taking a serious look at this issue, Wintermark says. "Hopefully, we will have some clarification soon." Manufacturers of GBCAs have agreed to further investigate the observation. "We are taking these data extremely seriously," says Conor McKechnie, a spokesperson for GE Healthcare. "While there is currently no clinical evidence of a health risk associated with the presence of gadolinium in the brain, we are working with the radiology community to better understand the issue." Anne-Laure Delasalle, communications director for the French pharmaceutical company Guerbet, says: "We, at Guerbet, agree with the current literature and [are] developing clinical guidelines … for [the agents'] use." Hess is hopeful that the observation of gadolinium deposits on MRI will ultimately be shown to be an imaging finding without any clinical significance. "We've been using it for more than two decades. Millions of patients have received the medication, and we aren't familiar with any long-term side effects yet," he says. "But the community needs to continue to gather data and consider all possible consequences to play it safe." It's hard to say how soon the issue will be resolved, Wintermark says. Health care professionals and patients are asked to report any adverse events or side effects related to the use of GBCAs to the FDA's MedWatch Safety Information and Adverse Event Reporting Program. "There are a large number of groups working very actively on this topic to try to shed some light and determine whether it's something we need to worry about or not. There are new studies published and released constantly," Wintermark says. The bottom line, he adds, is "we will have much more information in the months to come." — Beth W. Orenstein of Northampton, Pennsylvania, is a freelance medical writer and regular contributor to Radiology Today.